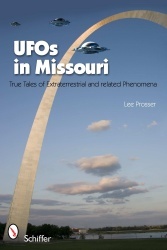 See the state of Missouri as you never have before - as a hotbed of UFO activity and paranormal phenomena. From time slips and vortices to extraterrestrials and interdimensional beings, the Show Me State appears to be a haven for all things supernatural. Hear about residents who have been "implanted" or experienced missing time. Learn what to say to an Extraterrestrial and how to call down a UFO. Visit the many sites of UFO sightings, including Excelsior Springs, Harrisonville, Marshfield, and Northview. Travel to Missouri's own Bermuda Triangle - Joplin, Springfield, and Branson. New perspectives on UFOs, mysterious phenomena, intriguing tales, and scary UFO revelations are just waiting to be explored, as the extraterrestrials beckon. Will you answer their call?